Also available directly from Mel Bay (also as a download: http://www.melbay.com/ondemand.asp - you'll have to download and install Mel Bay On Demand first). Note: If you buy it as a download, you will get the PDF booklet, but it can be tricky to find. If you're using the built-in Brainplayer, it will download to "My Documents" or "Documents". Using Quicktime, you should see a PDF button on the player. The DVD should also be available from your local retail store, ask for it if they don't have it in stock. News: Tabs are now available for the DVD. If you've bought the DVD already, go here to get them (you'll need the password, the page explains). Hunter Robertson begins each tune with a brief introduction and then presents each one in four different stages to help you learn it easily. First, Hunter plays the tune at full speed. Next, he breaks it down, with verbal instruction. The tune is then slowed to half speed so that you can easily follow the right and left hand finger positions, which are shown with a split screen throughout. Finally, the tune is played at a medium tempo for you to practice along with. The DVD also includes a video of Hunter demonstrating right and left hand techniques and a detailed 26 page PDF booklet with notes on the tunes, general technical information, and thoughts on learning, playing, and arranging for the banjo. Note: The PDF booklet is a digital file on the disc itself which can be read with "Adobe Reader", a free program. If you buy the DVD as a download, see the notes under the picture of the DVD cover (to the left) for information on how to access the PDF. A brief look at 2 and 3-finger picking. A full-length performance video of the song “Raleigh & Spencer”. First a disclaimer: I’m not what you’d call a major consumer of banjo instruction DVDs. In fact, prior to the DVD I’m reviewing here, I’ve spent time with exactly one of them: Mike Seeger’s classic Southern Banjo Styles #1 (which actually had its origins on VHS tape). That one was entertaining and informative, but was lacking quite a bit in terms of actual instruction. I’ve seen parts of a few other instructional DVDs, but they just didn’t suit my “figure it-out-yourself” personal learning style. I did some research and discovered that quite a few clawhammer banjo instructional DVDs are available for students of all levels. This review focuses on Hunter Robertson’s first video product, released earlier this year. Robertson is an excellent player and singer, and has also recorded two CDs. And as I discovered, he’s also an exceptional instructor. Unfortunate Puppy and Other Fine Tunes is intended for intermediate and advanced players. It teaches ten tunes (with varying levels of difficulty), and also includes some extra features, which I describe later. In addition, the disc contains a 26-page electronic booklet (in PDF format) that includes detailed notes for each tune, links to other recordings of the tunes, and lots of good old banjo-playing advice. Don’t ignore that PDF file. If you’re just starting out on banjo, you’ll be better served by choosing an introductory DVD from somebody like Bob Carlin, Chris Coole, David Holt, Dan Levenson, or Ken Perlman. The DVD is jam-packed with 133 minutes of content, and none of it’s filler. The video format is widescreen (16:9 aspect ratio), which is ideal for the split screen technique he uses to show both hands simultaneously. The audio and video quality of this DVD is excellent. I watched it on my computer, as well as a large screen TV. The navigation structure of the DVD is such that you can quickly get to any part with only a few clicks or button presses. You can view some samples from the DVD on YouTube, or at Hunter's web site. Two things make this DVD different from your typical instructional banjo video: (1) It does not include tabs for the tunes, and (2) Robertson plays all the tunes on a fretless banjo. An instructional video without tabs? Heresy! Well, not really. A common discussion topic on the Banjo Hangout deals with learning from tabs vs. learning by ear. I’ve always been in the latter camp, and this DVD makes an excellent case for learning by ear -- although being able to watch both of his hands means that it doesn’t have to be strictly by ear. Using tab sometimes promotes note-by-note memorization, something that Robertson does not encourage. But if you absolutely must have tab, here’s some good news. If you purchase the DVD, you’ll be able to download the tabs for the tunes, created by Tony Spadero (AKA oldwoodchuck at Banjo Hangout). Check the author’s website (www.hunterrobertson.com) for details. One of the tabs is included here. Keep in mind that it's just an approximation of what's really happening in the tune. Robertson uses an old inexpensive Harmony Reso-Tone banjo, with the frets filed down to make it a fretless. The fret lines are clearly visible, though, so the student can always tell which fret position is being used. In addition, the banjo has black strings so they show up better in the videos. Initially, I had my doubts about his use of a fretless banjo, but it works just fine for the lessons. But those who play a normal fretted banjo won’t be able to get the “in between” notes without a bit of string bending. If you play the DVD sequentially, you’ll first see a short introduction, followed by a fast-paced and concise 12-minute overview of just about every right and left hand technique I’ve ever heard of. You’ll see explanations and demos of drop thumb, M skips, Galax licks, slides, push-offs, hammer-ons, pull-offs, alternate string pull-offs, and more. Noticeably absent is the “cluck,” a technique Robertson doesn’t use much. It’s a great overview, and I think even veteran players will benefit from watching this section. The tunes are presented by tuning, rather than relative difficulty, so it’s up to the student to determine which tunes to tackle first. I’d suggest Lonesome John and Candy Girl, which happen to be the first two tunes. Each tune lesson starts with a brief introduction in which Hunter describes the tuning, part structure, and the source of the tune. Then Robertson plays the tune at full speed, several times through, usually with variations. Next, he breaks the tune down and provides some detailed verbal instruction for tricky parts or phrases – just as a real-life instructor might do. This is followed by a half speed recording for those who want to focus on a particular part. Finally, he plays the tune at a moderate tempo, suitable for play-along practice. All of the video segments use a split-screen technique that clearly shows both hands simultaneously. This method of presenting the material works amazingly well. The DVD has 96 minutes of this type of instruction, so each tune gets a bit less than ten minutes of coverage. That’s just enough time, as far as I’m concerned. My only nitpick with this DVD is that all of tunes are played one note lower than the key in which they are normally played. He plays A tunes in G, D tunes in C, and G tunes in F. His banjo certainly sounds good tuned a note lower (and Robertson prefers the feel of looser strings), but some (including me) would prefer that the tunes be in their normal keys. The relative string pitches are the same, of course, so using a capo at the second fret will put you at the traditionally-played key (but you won’t be able to play along with the DVD). On the other hand, when played as solo banjo arrangements, the pitch doesn’t really matter. The difficulty level of the tunes varies quite a bit. Candy Girl is the easiest, and Unfortunate Puppy is probably the most challenging. The best part of each lesson is when Robertson demonstrates and explains various techniques used in the tune. You see quite a few of the concepts that are demonstrated in the opening “techniques” segment used in actual practice. Robertson’s arrangement for each tune is based on a particular recording by a classic old-time fiddler – people like John Salyer, Wilson Douglas, Emmett Lundy, and Tommy Jarrell. He didn’t include the original source recordings for these tunes, but they are all available, and the PDF file includes links. In addition to the “techniques” section and the ten tune lessons, the DVD includes two extra features: a video of Robertson playing and singing Raleigh & Spenser, plus an 18-minute overview of old time 2- and 3-finger picking styles (using six additional tunes: Darlin’ Cora, Mole In the Ground, Roving Gambler, Drunken Hiccups, Danville Girl, and Sugar Baby). I can’t stress enough how good the video quality is on this DVD. Even the slowed-down segments are crisp and blur-free. In some cases, the slowed down audio suffers a bit (which is to be expected), but it never gets out of the acceptable range. This DVD sets a new standard for banjo instructional material, and I can’t imagine any clawhammer player who couldn’t pick up a few things while watching it. I have only one suggestion: Provide a “play all” option that simply plays the full speed version of all ten tracks sequentially. It would be entertaining to watch, and, as background music, help the player become familiar with the tunes. Better yet, include MP3 files on the DVD so students can use their own slow-down software. If you’re the type of player who has grown to depend on tab when learning a new tune, this DVD (along with some time and effort) might assist you in breaking free from that constraint. But, as I mentioned, this product is not a start-from-scratch package for beginners. The 12-minute introductory video provides a quick overview of clawhammer techniques, but don’t expect this video to provide everything a new player must know. But on the other hand, I think most new players would certainly enjoy seeing a banjo master in action – especially one who explains what he’s doing. This DVD is competitively priced – the cost of about two CDs, or about half of what you’d pay for a single private lesson. 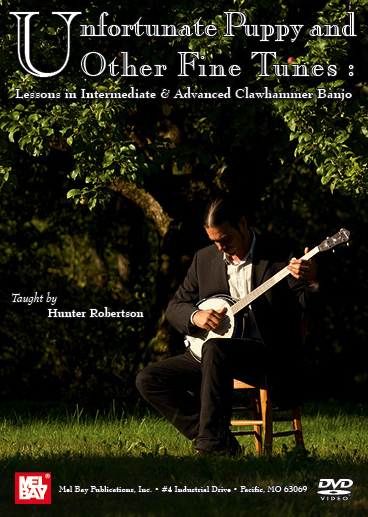 I wanted to review this excellent new instructional dvd by Hunter Robertson that teaches 10 banjo arrangements of fiddle tunes in the clawhammer style. There are not so many instructional dvds on the market that focus on old-time banjo styles (the greatest being the 3 Dvds “Southern Banjo Styles” by Mike Seeger) and this one is rather aimed at advanced players so rejoice, all of you banjo frailers! Hunter is a great banjo player who already recorded two discs (the last one i reviewed on this blog here) and he did a fantastic job on this lesson by choosing well-known and not so well-known fiddle tunes and came out with intricate and enjoyable arrangements that will challenge most players. The tunes are by legends of old-time fiddling like John Morgan Salyer, Tommy Jarrell, Emmett Lundy, William Stepp, Uncle Bunt Stephens, Hobart Smith… There are at least four different banjo tunings used and a full array of clawhammer techniques are displayed and explained. This is about the content of the lesson but the form is also really well made, with camera angles and slow motions allowing the viewer to see both hands at work and not missing a lick. It’s worth mentioning that Hunter uses a rather simple Harmony banjo that was turn to a fretless (but you still see the frets marks) to teach the lesson and proves that one doesn’t have to possess a fancy instrument to play great old-time mountain music. As a bonus, Hunter explain a bit about two and three-finger old-time picking styles, and you can see a clip of him playing and singing (Hunter has a powerful and raucus voice that reminds me a bit of australian rock singer Nick Cave) the great song “Raleigh and Spencer”. For me, the cherry on top of this great lesson is the pdf booklet that goes in lenght to cite the sources of the tunes, the tunings, the discography and many other details that are really invaluable informations for the player and listener. Well done, Hunter! As I said above, all of the arrangements on these dvd were inspired by old field recordings and 78rpm records of great fiddlers and most of these are available for free online thanks to the Digital Library of Appalachia (on the pdf booklet, you just have to click on the link to be directed to the exact page). Nevertheless, I compiled myself the 10 original fiddle tunes to help me learn them with Hunter’s banjo versions and you can download them as well for the same purpose and for your listening pleasure (just be warned that the recording quality on some of them is very bad…). On this well-done instructional video, Hunter Robertson lays out the groundwork for learning old-time banjo—not just clawhammer style, but also two- and three-finger styles. The main thrust of this DVD is to present right- and left-hand techniques, tunings grounded in the fundamentals that build an informed style. Robertson gives a brief description of each tune, then plays the tune. Next, he breaks the tune down with a verbal description of what he is doing. Then the tune is played slowed so that you can easily follow the right- and left-hand finger positions. Finally, it’s played at a medium tempo for you to practice along. Split-screens showing the two hands are used throughout. There are visual guides to help you keep on track. He teaches ten tunes played in the clawhammer-style in this fashion. There is a wonderful section on right-hand techniques where Robertson takes a good amount of time to explain the techniques and demonstrate them, following the same procedure he uses for the ten clawhammer tunes. The tunes are credited to his source and he attempts to catch the essence of that performance. He does not lavishly copy the source, but he does successfully present a rendition that is honest and accurate. The complexity of the tunes will take an intermediate to advanced ability to pull off. If you have mastered the right-hand techniques addressed in that section, it will make it much easier to tackle the tunes. There is an in-depth section that covers several factors for mastering these styles. Robertson discusses thumb lead versus index lead in the two-finger style and does a nice job of demonstrating the old time three-finger approach. He demonstrates the piece “in the style” of a source and not necessarily a note-for-note representation of anyone’s style. The split screen reveals how both hands interact. He also slows these pieces down, as well. He does a nice job of breaking down Dock Boggs’ “Danville Girl” and “Sugar Baby” to demonstrate the essence of Dock’s style. The other extra is a performance of “Raleigh & Spencer” that can also be viewed on YouTube. Robertson’s guttural vocals and forceful banjo playing make for an impressive performance. The banjo player with the rough voice, who at this time is living in Geneva, submits an educational DVD which has been released by a leading US music publisher. Ten known old-time titles like “Cripple Creak” and “Bonaparte’s Retreat” he wants to teach us here, with the explicit purpose that we to not imitate everything slavishly, but develop our own ideas. With that, he plays a fretless banjo. In contrast to the dialog based AcuTab DVDs, Robertson conducts frontal lessons. Basically, the screen is divided for the left and the right hand, in close-up. As an introduction, Roberson shows the various striking techniques, then the pieces are introduced in normal speed, then technical detail is explained, and finally the pieces are played again in half and medium speed. One should actually bring along some knowledge of the clawhammer style, the entrance level seems high. The clawhammer style may seem clumsy and primitive, here it becomes clear how subtle and elaborate it can be and how every musician has his peculiarities. Except in “Raleigh & Spencer”, Robertson does not sing (he anyhow rather snarls), not even where there is a text. Finally, the demonstrates 2- and the 3-finger picking and plays “Raleigh & Spencer” again fully. We knew that Hunter Robertson was an excellent banjo player, his last CD If You Want to Go to Sleep, Go to Bed (Trad Mag n° 129) proved it to us, if needed. Now, with this DVD, we also know that he's an excellent teacher. This new DVD isn't a beginner's clawhammer banjo method but is more dedicated to those who already have a good grounding in the style. The idea behind these lessons is excellent, that is, learning to play well known (at least to aficionados) versions of fiddle tunes on the banjo, such as "Cripple Creek", "Bonaparte's Retreat", "Ducks on the Millpond"… ten fiddle tunes in all. The first chapter is a review of all the clawhammer banjo player's "tools" such as hammer-ons, pull-offs, alternate string pull-offs, slides and other techniques used in the style. For each piece, Hunter plays a version at normal speed, then he explains the difficulties of the piece and then plays it again at a slower pace so that you can train by playing it along with him. As a bonus, Hunter gives a quick look at two and three-finger picking styles. It isn't often that one is present to witness a real revolution, but I feel I have seen the future of Banjo Instruction with Hunter Robertson's new video “The Unfortunate Puppy & Other Fine Tunes: Lessons in Intermediate & Advanced Clawhammer Banjo”. The work Hunter and his associate, videographer Jonathan Vanballenberghe of Open Lens Productions openlensproductions.com/ have done with this video will quickly bring the standard for DVD lessons up from that of purely supplemental material to a vastly improved method of teaching stringed and fretted instruments. I'm not joking. This video has as much to teach banjo teachers as has for banjo students, and it will influence All fretted and stringed instrument teaching DVDs for decades to come. Most banjo videos, consist of a medium shot of the player/teacher with a downright dinky close-up of either the left or right hand inserted into the blank space off to his left side. Both hands come out quite small, and the actual playing is really too fast to be caught on normal (30 frames a second) video. Hunter and Vanballenberghe have dumped that format and created a new way that shows both hands large and clear. The view appears to be what you would see sitting in the usual student's position across from a teacher with a banjo. However, instead of wasting screen space the picture has been sectioned, leaving out the dull, unchanging landscape between the frailing and the fretting. Why Didn't I think of That? While this innovation alone would be a major improvement to most videos, it is only after extended viewing that I realized each of the hands had been filmed to be seen at the best angle for catching the details of the playing. It is easy to see exactly what happens at the fingers and frets level of the left hand and to catch exactly which string is being plucked by the right. While this alone would be revolutionary there is another big improvement in the presentation. The video was probably filmed with the camera running at double speed (60 frames per second) so that when it is slowed down to 30 there is remarkably little of that low speed video mush in the picture. You can see the hands working side by side in smooth slo-mo. Every detail is right smack in your face. You can't miss a thing. Each of the tunes is presented in four ways – at full speed, complete with variations, followed by a section at half speed using the slo-mo technique described above. Then Hunter goes over the tune in detail showing each melodic figure complete with spoken playing notes explaining the various techniques as Hunter demos them. Finally there is a simple medium speed version designed so the student can play along with the teacher just as in a face to face lesson. Along with the 10 tune videos there is also a “Techniques Video” jam packed full of extremely useful stuff and well worth the price of the entire DVD. There is also an all too brief demonstration of Up Picked styles. The DVD cannot have much space left over. I suspect most players will return to all the lessons from time to time in order to gain new insights from them. While Hunter describes this video as being for Intermediate to Advanced students I am going to respectfully disagree. I don't think you have to be “advanced” much beyond beginning player to get more than your money's worth from The Unfortunate Puppy. Anyone with the basic strokes down comfortably, who can play the common clawhammer rhythms and follow clearly presented examples should be able to use these videos to one degree or another, and will know more about clawhammer in general than most other Beginners or Intermediate or Advanced players. Furthermore you will be learning from a master player and a master instructor – these aren't always one and the same person. The banjo world is extremely lucky to have Hunter Robertson. He is a great banjo player and The Unfortunate Puppy, sets the Gold Standard for teaching videos. Many of the techniques described in the Unfortunate Puppy are also found in Chapter 4 of Rocket Science Banjo. Double Pull-Offs, Down Slides, The M Skip, etc are all covered in my book, making it a good companion for Hunter's video. There is even an example of Hunter’s syncopated M Skip and the “Rushed Thumb Stroke – which I described in Ken Perlman's 1981 book “Clawhammer Style Banjo”, and which will eventually be covered in RSB too. There are even versions of a couple tunes on the video tabbed out in the book. I think Hunter's technique video alone is worth the price of the DVD. Everyone has to make their own decision as to when they are ready for this material but I would recommend it to my students on the early side rather than wait. I think that most people will get their money's worth, and that over time it will prove more than just useful to anyone willing to put some time into learning the material. Nothing “teaches” you the banjo – you gotta do all the work – even the banjo doesn't really do anything for you. That said, this is the best instructional video I've ever seen. It is well worth your money and more importantly, it is well worth your time. Diggin' it, Hunter. Great set of tunes, fine versions of them, and I like this form of instruction. The package is packed (!) so I haven't gotten through it all, but I recommend it highly (and will pitch it to my students as well). – T.I. The lessons are wonderfully presented. The half-speed videos are great because they provide a more realistic view of the fingers in motion than when one simply plays deliberately slow. I hope many people take advantage of this most enlightening project. There's much to learn. – R.M. I got it yesterday but only got the chance to look at it this afternoon. I thought there's no way I'll ever be able to learn anything from this. Half an hour later I had learnt the first half of Lonesome John... It's wonderful. Thank you. – S.D. Got the DVD yesterday and spent some hours with it. May well be the best old time banjo instructional film since Mike Seeger's Southern Banjo Styles series. Hunter's playing is inspiring, the presentation is very clear, the choice of material is good, and I appreciate the way in which he continually refers the viewer back to the original recordings of the versions he's playing. – S.L. It's really well presented, professionally made and very entertaining. Most importantly, the tunes are excellent, and even the ones I know have enough variation and interest to make me want to learn them again. – M.R. I've only been playing 15 months but found I could follow it easily. It's by far the best video tutor I've come across, really clear camera views and great collection of tunes. 1st class! – N.C.
What an awesome job you did on this project! This is by far the best instructional material I have seen. Just Awesome! – J.Y.